Hold the phone! …or maybe that should be hold the browser! Now you can make a phone call with your computer. New WebRTC technology lets you call anyone with just a click in your Google Chrome browser. It’s simple, high quality audio and it’s free! This is great for allowing international participants to join your conference calls without calling a U.S. phone number. 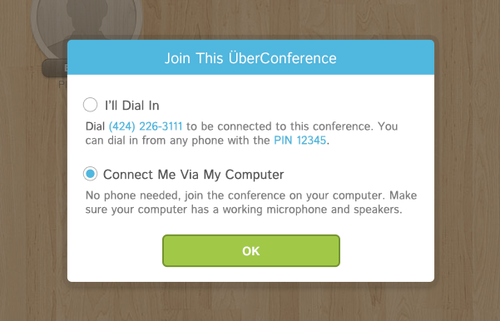 It also means you can use ÜberConference from anywhere in the world by calling in through the web. Wait, what’s WebRTC? It means Web Real Time Communications. ÜberConference is one of the earliest adopters of this new technology that allows you to call anyone, anywhere in the world right from your computer instead of your phone. 1) Schedule a conference right now or in the future by clicking the “New Conference” button. Add participants for the conference and any advanced settings and click “Create Conference”. 2) When entering the conference page (either directly taken there if the conference is now, or when the conference starts) a popup will display your connection options. From here you can choose to connect from your computer by selecting the option and hitting ok.
3) Chrome will then ask if you want to allow ÜberConference to use your microphone, from here if you have multiple microphones you can select the one you want to use. 4) Sit back and let ÜberConference connect you to your conference. That’s it! Now you can have conference calls with anyone, anywhere in the world right from your Chrome browser using ÜberConference. 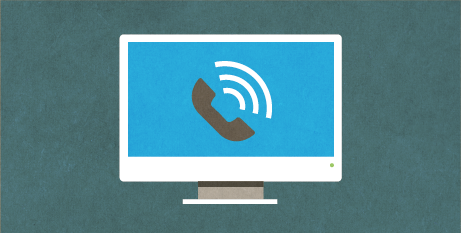 Note – The other conference call participants in your call are able to connect via their computer as well, when they receive the notification about the conference they can navigate to the URL given to them and choose to connect the same way you did. Both CEO Craig Walker and Head of Telephony T.R. Missner will be speaking at the WebRTC Conference and Expo, November 27-29, in South San Francisco. If you are thinking of going, you can get a 25% discount with this link.